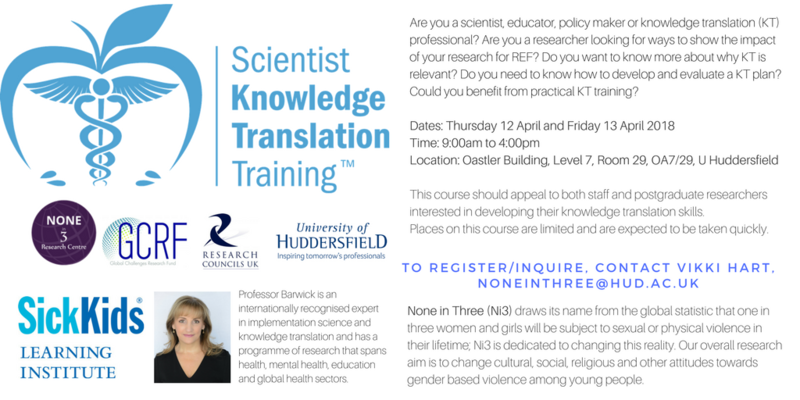 None in Three (Ni3) is pleased to welcome Professor Melanie Barwick to conduct a two-day training seminar entitled: Science Knowledge, Translation Training. The sessions will be conducted by Professor Barwick who is an internationally recognized expert in implementation science and knowledge translation and has a programme of research that spans health, mental health, education and global sectors. Professor Barwick is a Registered Psychologist and the Head and Senior Scientist in The Child and Youth Mental Health Research Unit with the Department of Psychiatry at Sick Kids Hospital in Toronto. The training session is suited for both staff and post-graduate researchers interested in developing their knowledge translation skills. Persons who are attending the training workshop are reminded that they should attend both training days in order to be issued with a certificate upon completion. None in Three draws its name from the global statistic that one in three women and girls are subjected to sexual and physical violence in their lifetime. Ni3 is dedicated to changing this reality. We are thrilled to invite Professor Barwick to share her knowledge on April 12-13 from 9am -4pm at Oastler Building Level 7, Room 29, Oa7/29, University of Huddersfield, UK.